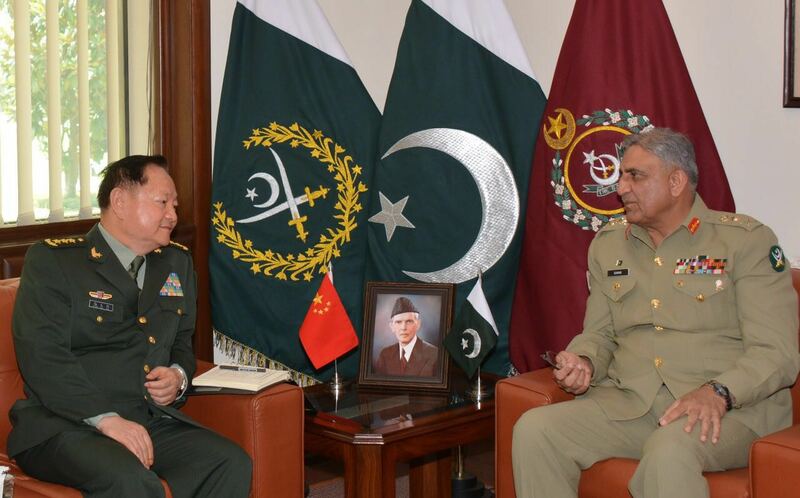 General Zhang Youxia, Vice Chairman of Chinese Central Military Commission(CMC) called on General Qamar Javed Bajwa, Chief of Army Staff (COAS) on Thursday at GHQ. The meeting was followed by delegation level talks. During the meeting, matters of mutual interest, regional security and enhanced bilateral defence cooperation came under discussion. COAS said that Pak – China relations are all weather and based on mutual trust and confidence. Highlighting Pak–China defence and security cooperation, General Zhang Youxia said, “China and Pakistan are iron brothers, all weather friends and strategic partners. We share the tradition of mutual understanding, mutual trust and mutual support. China deeply appreciates the achievements of Pakistan Army in counter terrorism and the successful operation in various fields. China values the efforts of Pakistan Army in fighting against all terrorists groups including East Turkistan Islamic Movement (ETIM). CPEC is equally beneficial to both China and Pakistan. Both countries are committed to its continuous process and future success. Efforts of Pakistan Army in safeguarding CPEC security are highly appreciated. We look forward to close cooperation with Pakistan to ensure security of CPEC”. Both sides also signed different MoUs for bilateral Defence cooperation. To pay homage to the martyrs of Pakistan Army, the visiting dignitary laid floral wreath at Yadgar-e-Shuhada. A smartly turned out contingent of Pakistan Army presented guard of honour to Vice Chairman of Chinese CMC.